Visit the Forbidden City and Tiananmen Square. Stepping out across the peaceful semi-ruin of a section of the Great Wall is like walking in the footsteps of the past. Far from the tourist crowds we are able to get a great sense of the scale and the majesty of this remarkable piece of engineering without rushing through. 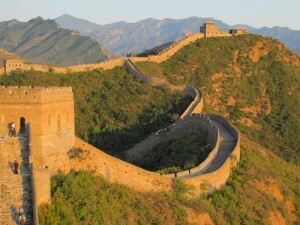 This Great Wall Challenge has plenty of exciting twists, turns up downs and steps! You will trek along various contrasting sections of the wall, we get closer to day-to-day life in rural China before returning to Beijing, a city steeped in history yet plunging headlong into modernity. If the above dates do not suit you and you have a group of over 10 people, please get in touch as we’d be happy to set up a date that meets with your requirements between May – September (dependent on accommodation availability). Simply email: info@adventurousewe.co.uk or call 01492 588 069. Drinking water on challenge days, 3 meals a day (unless otherwise stated in the itinerary). International departure from London The long-awaited journey begins at the airport. Any last minute nerves will fade away as we set off for our exciting adventure to the famous Great Wall of China. Arrive in Beijing and transfer to our hotel. The remainder of the day is free for to either explore Beijing or rest after the long flight. The group will then meet together for an evening meal and receive a full expedition brief from both the Tour Leader and Local Guide. Plus, it’s your chance to ask any last minute questions. Today will be a day to remember as we begin our adventure to the Great Wall of China. We will catch our first glimpse of the magnificent Great Wall as we drive to the Huangyaguan (2.5 hours) and check in at our hotel. Following lunch we will be transferred to the entrance gate of Taipingzai (20 minutes). This marks the start our first day of trekking. We will trek along the part of Huangyaguan Great Wall, up and down many steps. That evening, dinner will be served in a local restaurant with a campfire outside. Our day’s walk begins where we left the Wall yesterday, and we head up the steep renovated steps towards what appears to be a sheer cliff face. This is where we encounter ‘Heaven’s Ladder’, a steep climb of over 200 steps leading us up the cliff face. There are fabulous views from the top, and once we have caught our breath the path continues gradually on steep tracks through forest, up to the top of the ridge. Once again we join old the Wall, and follow it along the contours of the mountain until we clamber down into the valley below. We bed down in the houses of a local village, a real cultural experience. Night farmers’ houses. Waving goodbye to our hospitable hosts, we head up through the farming terraces immediately behind the village. The path is steep, and the terraces soon give way to rocky hillsides scattered with scrub. Eventually we re-join the Wall, which is unrestored and crumbling so we follow a path which takes us alongside it, with fabulous views along the ridgeline to the day’s highest point. We then drop down the hillside and make our way on winding tracks through trees back into the valley, where farmers grow maize, and walnut and fruit trees. Back at the village, we walk along the village road to our waiting transport. Our drive through the mountains to Jinshanlin is very scenic. Night mountain hotel. Starting where we left off yesterday, we head up the carefully restored steps which take us into the mountains one final time. There are a few sections on older section of the wall and some dirt tracks, but for most of today we walk on good flagstones. The scenery is superb with rolling hills fading into the distance, dotted with many watchtowers offering classic views of the Great Wall snaking into the distance. After time to soak up this breathtaking panorama, we head down to meet our waiting transport which takes us to Mutianyu. Night mountain hotel. It’s a short transfer into the village, where the day’s trek begins. We can see the Wall high on the ridge ahead of us, and slowly wind our way up to it. Once more our efforts are rewarded by stunning views as the Wall disappears from view in both directions, before descending to Mutianyu, a much visited section of the wall but certainly worthy of a few pics. What goes up must come down, so be ready for hundreds of steps down to the waiting coach. Once en route, the bus will stop at either a silk or jade factory as it heads back to Beijing. Overnight in a hotel. Dinner not included. All nationalities require a full passport that must be valid for 6 months beyond the intended length of stay. It is your responsibility to have the correct personal documents and to obtain your own visa, £150.00 at the time of writing. We will provide you with more information about entry visas in the lead-up to your trip. If you would like to start having a look at the information you can visit the Chinese Visa Application website Visa Application. However, you should not apply before 3 months prior to departure due to the validity of the visa. Adventurous Ewe is not responsible for the actions of local immigration and customs officials, whether at points of entry or otherwise, and any subsequent effects. Spring and autumn are good times to travel, with warm sunny days which aren’t too hot or cold, though it can be cooler up in the hills. Rain showers aren’t unusual, and it can be windy. The autumn can be cooler than spring. Weather conditions can change quickly, and you should be prepared for anything. Average temperatures in Beijing range between 7-27°C. In Beijing you will stay in standard 3* hotels sharing in twin rooms, to mare basic hotels while on the trek, we will also spend one night in farmer’s houses sleeping dorms, this is a great chance to experience rural China. You will start the day around 6.30am, with breakfast and a short briefing on the day ahead, fill your water bottles and collect your packed lunches prior to starting the days trek around 08.00am. Everyone can trek at their own pace within reason and there will plenty of short breaks. Lunch is normally 1/2 hour break and you will be trekking between 5-7 hours per day. You will have time to relax before our evening meal. We recommend that you organise your kit and re-pack your day pack the night before your following day of trekking to help ensure everyone leave on time the following morning.Some sections of your trek a very remote so please be prepared to spend time in areas where facilities and services are extremely limited. Walking hours stated are given as approximates only. Timings stated will vary depending on the pace of your group. Food is basic but filling. Breakfast has become more westernised in recent years, with eggs, tomato and cucumber, as well as cooked meats. Lunch will usually be a sandwich along with nuts, snacks and fruit. Dinner will consist of Chinese dishes and of course rice or noodles. There will, of course, be vegetarian options provided, although the choice is more limited. All participants but especially those with personal eating restrictions should bring snacks to supplement their meals. During trekking day’s we recommend you bring your own favourite snacks such as chocolate, energy bars, fruit gums etc, as you will be eating Chinese food everyday – this can become monotonous for even the most adventurous eater!! The tap-water is not safe to drink. Bottled water will be provided during the trekking sections, and you can buy bottled water or soft drinks in hotels and lodges for meals (around 5 Yuan, or 50p). Please let us know prior to departure if you have any specific dietary requirements or allergies. All Adventurous Ewe treks operate in a small group style which means you’ll stay under the radar, travel the local way and eat the local. You’ll have the unsurpassed knowledge of your local leader, taking you out of the guidebooks and into a world of incredible landscapes and wildlife you’re waiting to discover. You can also play your part by ensuring all rubbish is disposed of responsibly and you leave no trace during your trekking challenge.Adventurous Ewe follow the local guidelines on cultural and environmental protection and respect. You will need to pay a non-refundable deposit of £240 at the time of booking. It is possible to reserve a place on this challenge by email to info@adventurousewe.co.uk, however you will need to pay your deposit of £240 to confirm your place on this trek together with completing a booking form.